While the style was once nearly extinct, Gose has been revitalized among craft and homebrewers in recent years. A rich wit bier utilizing zested blood oranges to provide citrus kick. Recipe from professional chef and culinary consultant Mark Molinaro. You can think of this beer as a cross between a wit beer and and a schwarzbier, although it is not quite that dark. Venkman’s Vit is finished with Sterling hops (whose character is seen by some as a cross between Saaz and Mt. Hood hops) and spiced with the zest from an Oro Blanco Grapefruit (which is a cross between a grapefruit and a pummelo) and should appeal to anyone who thinks that “crossing the streams” might be a great idea. Wheat meets yeast in the German hefeweizen. 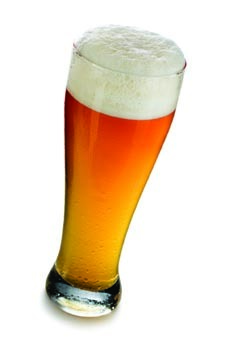 Brewmaster Darron Welch provides the recipe for their witbier. Recipe submitted by Ben Knoerdel formerly of Ben’s Homebrew in Tarentum, Pennsylvania. This is a light, crisp and wonderfully delicious beer Ben made for his wife who doesn’t like bitter, hoppy beers. Three US brewers discuss brewing a style that is all about the USA: American wheat. American wheat owes some of its heritage to German wheat beers, but this style is decidedly New World. Dunkelweizen, a dark, German wheat beer with just the right balance of malty/bready flavors and wheat beer aroma.